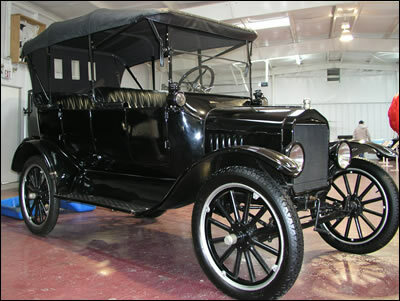 The Model T Ford was affectionately referred to as “The Tin Lizzie”. Between 1909 and 1927, fifteen million Model T’s were built. It was the car that retired the horse and put America on wheels. You can paint it any color, so long as it’s black. It has never been proven that Henry Ford said this, but the phrase has survived for more than seventy-five years. You are looking at a 1920 Model T touring car. It is a body off frame restoration. New interior, new top, new tires, new wiring, etc. It has electric starters, an after market accessory. The 1920 listed for $440. On the floorboard were three pedals. The left pedal was the “go pedal”. The right pedal was the “stop pedal”. The center pedal was the “back up pedal”. The Model T was the “first car” for many Americans.